CIBSE's new guidance to be launched in September 2013 is created to evaluate as accurately as possible building operational energy performance at design stage. Energy models based on national calculation methodology (NCM) templates can only get you so far. Their purpose is comparison of various design options and compliance with building regulations. 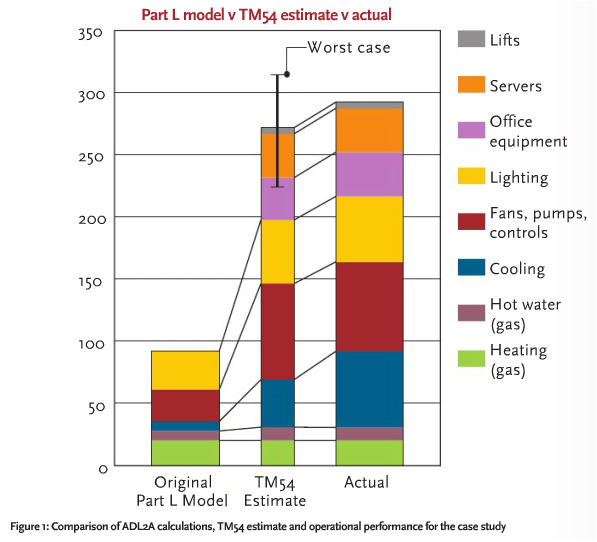 However as TM54's BBC broadcasting house case study clearly proves, such models must not be taken as an estimate of operational energy performance. Based on a comparison presented in CIBSE's Sept. 2013 edition, between a dynamic NCM based energy model, TM54 methodology and actual 5-year operational energy data, results show that the NCM based model estimated the case study's energy consumption to be one third of that measured. On the other hand the TM54 methodology came very close (less than 10% deviation). To be fair, one third of the measured energy consumption was allocated to lifts, servers and office equipment which were not calculated in the NCM based energy model. Nevertheless energy consumptions especially regarding cooling, pumps & fans & controls and lighting seem to have been largely underestimated in the case of this particular case study. The above greater deviation of L2A compliant energy models was expected at some extent, as demonstrating compliance with regulations requires removing some of the input variables in order to make sensible comparisons amongst buildings used in different ways. Only fixed building services i.e. heating, cooling, ventilation and lighting could be included. Has been built on TM22 energy assessment and reporting methodology principles to ensure end users are reported. Energy use calculations are taken from CIBSE guidance regarding specific end uses. Dynamic simulation (DSM) has been used regarding heating, cooling, fan & pump energy to estimate energy use. Occupants have been consulted in order to achieve most accurate operational hours and energy management regimes. All energy uses are included. Existing energy usage benchmarks are considered in order to ensure input figures are sensible. Results are presented as a range aknowledging the uncertainty in such type of predictions. The TM54 approach is based on uncoupling a regulation compliant dynamic simulation model from NCM templates and connecting it to spreadsheets based on operational hours specified by the actual occupants. It is directly connected to calculations based on other CIBSE documents i.e. lighting calculations based on LENI (lighting energy numeric indicator), lift-escalator calculations base on CIBSE Guide D.
The guidance applied in this particular case study showed that a 4% improvement in the chiller efficiency for example could not effect considerably the energy outcome whereas an hour/day reduction of the operational hours lead to an 8% reduction. In the same way shutting down the building during weekends lead to a 19% reduction. Results of the calculations are all presented in simple graphs, including overall results but also broken down in the various end uses highlighting areas with unusual outcomes when compared to typical values of similar buildings. TM54 aims to provide practical guidance to designers in order to avoid nasty surprises for owners and operators down the line.